The tracker uses two solar panels wired so that they cancel each other out when they are both pointing at the sun. When the sun is on one side of the sensor, it output + on one of the output wires, when the sun is on the other side of the sensor, it output + on the other wire. This is connected to the coil from a hard drive read head, which causes it to move in either direction depending on the polarity of the output from the sensor. On the end of the read head, there is a magnet. There's two reed switches on either side of the magnet which, when activated by the magnet turn the motor. The motor is controlled by two relays - one to turn it on and one to reverse the motor. Soldering on the wires to the motor and the + - wires for the DPDT relay that reverses the motor. I wired all of the wires into a terminal block for easy connecting later on. The top two wires are the output to the motor. Red and black are + and - respectively, the other two wires are the signal wires, ground these to turn on and reverse the motor. The two solar panels are wired + to - so that they cancel each other out. When both of the panels are in full sun they will output approximately nothing. When one panel is lit, they output wires will be + and -. When the other panel is in sunlight, the output polarity will be the opposite way around. I made a simple holder for the solar panels out of a few bits of cardboard. The panels are set at about 45 degrees either side of the centre line. There is a piece in the centre (see below) that help shade the other panel when the sun is off the centre line. This is the assembled cardboard sensor. Now we can re-purpose this dead, but still gleaming masterpiece of electromechanical and electronic engineering into something useful again. It once held 750 Gb of some ones precious data before it died. I took the hard drive apart. At the bottom you can see the read head, it has a coil that is sandwiched between two very powerful neodymium magnets. 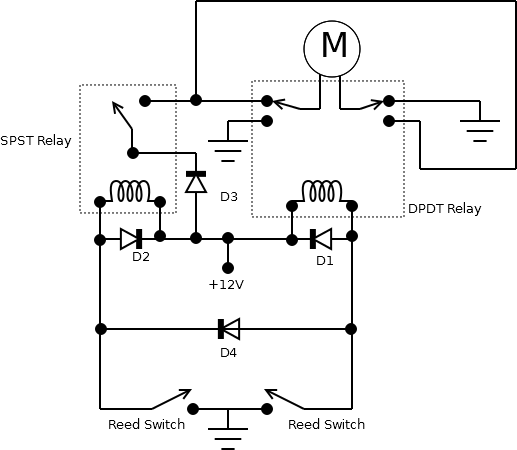 The reed will move left or right depending on the polarity of the supplied current. My eagerness to rip this thing apart, and a lack of torx bits meant that I broke the ribbon cable connecting to the read head. It would be MUCH more durable to use the original cable rather than solder on additional wires like I did! I soldered additional wires on! There is a neo magnet glued onto the end of the reed head. Lastly I added the reed switches either side off the magnet on the read head.